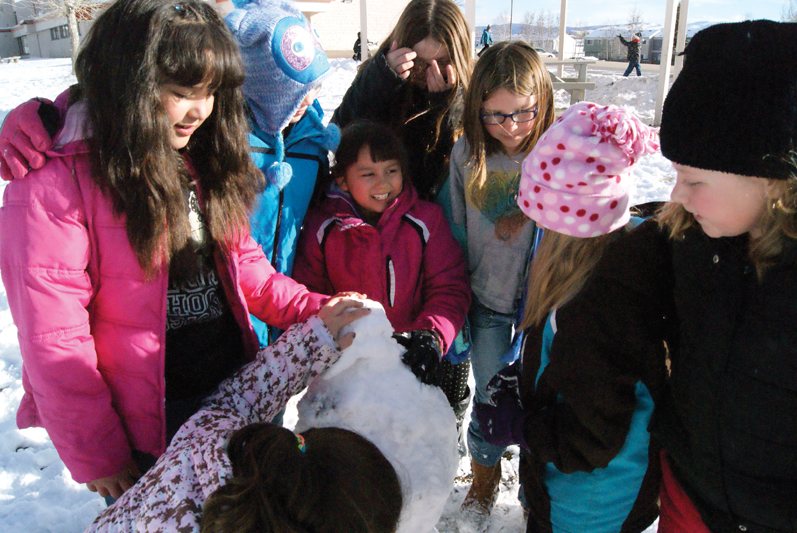 From left, Ridgeview fourth-grader Maria Balbuena, Mckinley Winkler, fourth grade, Sofia Lopez, third grade, Gwenevere Doizaki, fourth grade, Tressa Otis, fourth grade, Nadeia Koran, third grade, and Merinda Ross, third grade, play outside Tuesday afternoon and help build a snowman during recess. With the first big snowfall of the year, students bundled up this week to head out for recess and play in the flakes. Although it can be quite the process to bundle up adequately, Ridgeview third and fourth graders didn’t seem to mind. Fourth grader Gwenevere Doizaki said she was still hoping for snowfall reminiscent of years ago, when snow piled up in hills, “as tall as you,” Doizaki said. Students worked on snow forts, slides and snowmen Tuesday during their afternoon recess, slipping and sliding down the hills they created. The students are getting innovative with ways they use snow, too. “It’s refreshing and if you’re thirsty you can drink it,” said fourth grader Maria Balbuena. “Eating snow is fun,” chimed in fourth grader Tressa Otis. Ridgeview secretary Cyndee Owens said the school keeps extra winter clothes on hand for kids who may not come with anything or whose clothes get wet during recess and need different socks or pants. Owens said the kids generally go out even when it’s snowing because it doesn’t make much sense to keep them in. They need an opportunity to get all their energy out. Ridgeview’s health tech Karra Juergens keeps the clothes on hand for kids who need them, and said most of the items are either donated or unclaimed lost and found. Juergens said many parents will bring in winter clothes their kids have outgrown to be used for younger grades. Monday and Tuesday, coming right off the weekend are when students forget warm clothes most often Juergens said. Gloves are a common forgotten item. “Often times they’ll get to school with only one glove or lose one on the playground,” Juergens said. Even though Juergens said they keep pretty well stocked up on winter clothes, they could always use extra winter clothes donations. They can be dropped off at the school. On the playground Doizaki said she’s grateful for the snow.